E-Way Bill new features ! Easy to make E-way bill| New changes ! 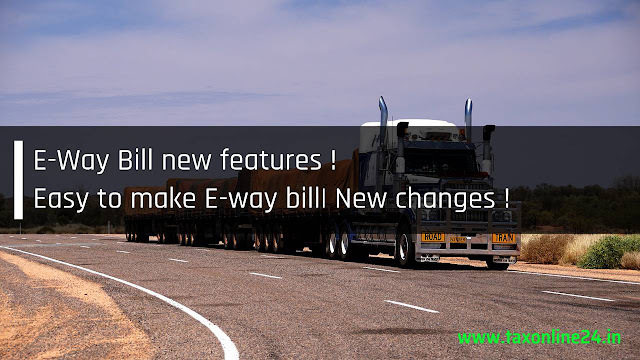 Following new features shall be added in the Eway bill portal. Now, E-waybill system is being enabled to auto calculate the route distance for movement of goods, based on the Postal PIN codes of source and destination locations. That is, the e-waybill system will calculate and display the actual distance between the supplier and recipient addresses. User is allowed to enter the actual distance as per his movement of goods. However, it will be limited to 10% more than the displayed distance for entry. Based on the representation received by the transporters, the government has decided not to allow generation of multiple e-way bills based on one invoice, by any party – consignor, consignee and transporter. As per the GST Act, the composition tax payers are not supposed to do Interstate transactions. Hence next version will not allow generation of e-way bill for inter-state movement, if the supplier is composition tax payer. 1. This post is for creating awareness about the newly introduced tax reform GST. 2. Here TaxOnline24 team does not intend to advertise/solicit clients & doesn’t take responsibility for any decisions taken on the basis of this post. REGISTRATION करना नहीं होगा आसान ! This post helps you to understanding about the strict verification which shall be done now while applying for the new GST Registration. Recently, a large number of registrations have been cancelled by the proper officer under the provisions of sub-section (2) of section 29 of the Central Goods and Services Act, 2017 (hereinafter referred to as „CGST Act‟) read with rule 21 of the Central Goods and Services Rules, 2017 (hereinafter referred to as „CGST Rules‟) on account of noncompliance of the said statutory provisions. 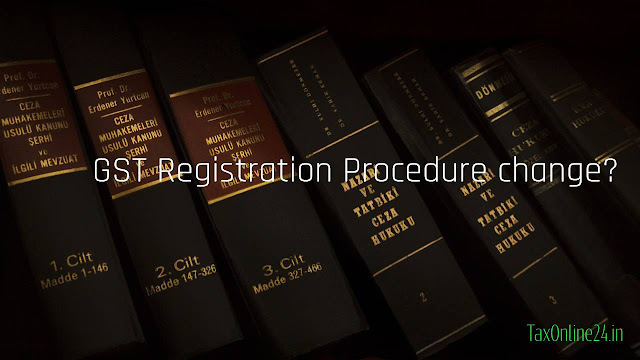 In this regard, instances have come to notice that such persons, who continue to carry on business and therefore are required to have registration under GST, are not applying for revocation of cancellation of registration as specified in section 30 of the CGST Act read with rule 23 of the CGST Rules. covered under the old/cancelled registration. Further, such persons would be required to pay all liabilities due from them for the relevant period in case they apply for revocation of cancellation of registration. may take separate registration on same PAN in the same State. Therefore, it is advised that where the applicant fails to furnish sufficient convincing justification or the proper officer is not satisfied with the clarification, information or documents furnished, then, his application for fresh registration may be considered for rejection. In the instant case the assessee is the beneficiary of Capital Gain Tax from sale of agricultural land under compulsory acquisition of urban land. The Assessing Officer reopened the assessment against the assessee for the reason that the assessee had not disclosed capital gains tax for land sold to Vizhinjam International Seaport Limited. The assessee claimed that the land was compulsorily acquired and the same being an agricultural land, coming within the notified area, was entitled to the benefit u/s 10(37) of the I.T Act. The contention of the assessee was rejected by the Assessing Officer, solely for the reason that the land in question was not compulsorily acquired but was transferred by executing a sale deed. Therefore, it was concluded by the Assessing Officer that the assessee was not entitled to the benefit of section 10(37) of the I.T Act. compulsory acquisition, but only executed through a negotiated sale deed. In the instant case, the entire procedure prescribed under the Land Acquisition Act was followed. The only price was fixed upon a negotiated settlement. The Income Tax Appellate Tribunal (ITAT), Cochin bench has held that the compulsory acquisition of urban land is eligible for tax deduction under the Income Tax Act, 1961. In the present case the assessee is a person who is engaged in business. The assessee claimed deduction of Rs.54000 p.m as rent expenses of his business. But the A.O denied to allow the deduction. The assess paid rent in cash. The rent paid in cash of Rs.54000 p.m without any proper supporting document in respect of rent payment i.e no lease rent agreement. Even there is no proper evidence that the premise has been used wholly for the running of the said business. Only the assessee has submitted selfsupporting vouchers with respect to the payment of rent in cash. Under this situation, the amount of rent paid in cash cannot be allowed as business expenses. Nipha Exports Pvt. Ltd. Is the applicant and engaged in manufacturing of agricultural machinery, seeks a Ruling on whether input tax credit is admissible on ambulances purchased for the benefit of the employees under legal requirement of the Factories Act, 1948. The concerned officer from the revenue has raised no objection to the admission of the application and admitted the said application. Eligibility for claiming input tax credit under section 16(1) is subject to the provisions of law at the time of occurrence of the taxable event, irrespective of when the claim is made. Second proviso to section 1 7(5)(b) of the GST Act, as it stands post amendment effective from 01/02/2019, is not applicable to a transaction made in November 2018. It is evident from above that input tax credit on inward supply of ambulance, being a motor vehicle, is not admissible under Section 1 7(5)(a) of the GST Act. The exception carved out under Section 17(5)(b)(iii)(A) of the GST Act for services which are obligatory for an employer to provide to its employees under any law for the time being in force is limited only to rent-a-cab, life insurance and health insurance. if provisioning of ambulance service to the employees is obligatory under the Factories Act, 1948. Input tax credit is not admissible on the ambulance purchased in November 2018, as Section 17(5) of the GST Act, as it stood in the relevant period, blocks any such enjoyment, even if provisioning of ambulance service to the employees is obligatory under the Factories Act, 1948. GSTR-8. Monthly - E-commerce operators who are required to deduct TCS (Tax collected at source) under GST. GSTR-1. Monthly - Summary of outward taxable supplies where Turnover exceeds Rs. 1.5 Crore. GSTR-6. Monthly – Details of ITC received and distributed by ISD. GSTR-5. Monthly - Summary of outward taxable supplies and tax payable by Non Resident Taxable person. 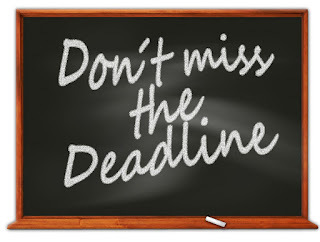 Due date of TRAN-1 is extended for certain taxpayers who could not complete filing due to tech glitch. Due date of TRAN-2 is extended for certain taxpayers who could not complete filing due to tech glitch. · Fourth instalment of advance tax for the assessment year 2019-20. · Due date for linking of Aadhaar number with PAN. does not have an agreement for exchange of the report etc. Note:- All dates are may be subject to change as per respective notification. Income Tax Department clearly said "we will Issue only Online Refunds from 01.03.2019. Online Refunds will be given only to bank accounts (savings/current/cash/OD) which are linked with PAN. and till up the details. If pre-validations is successful then your back account is link with pan and you are eligible to get online refund of income tax. Get your online refund directly and securely in your bank account. 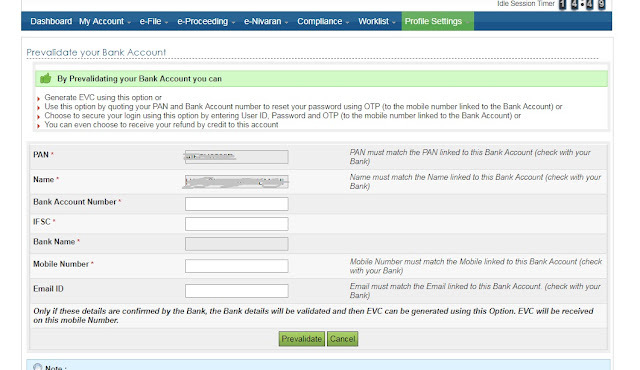 If you bank account not yet linked with PAN, contact your bank branch and provide your PAN details to them. → If your bank is integrated with the e-filing portal, pre-validation will be done directly through EVC and net banking route. → If your bank is not so integrated, then Income Tax Department will validate the bank account from the details filled up by you. GST However, in both cases, input tax credit (ITC) cannot be claimed. The new GST rate shall be applicable from 1st April 2019. GST Council has specified that an Intermediate tax on these development rights such as TDR, JDA, lease (premium), FSI will be exempt from GST for such residential properties on which GST is payable. The buyer of house will get a fair price and affordable housing gets very attractive with GST @ 1%. Interest of the buyer/consumer will be protected; ITC benefits not being passed to them shall become a non-issue. How to Become a CA in First Attempt? CA which is an abbreviation of Chartered Accountant is a dream course for every Commerce Student. Almost every student who opts for commerce stream dreams of becoming a CA. It is a highly rated profession in our country and a continuously growing field. This profession offers great opportunities and a good pay scale. But all the opportunities and salary packages depend upon the knowledge you have and the number of attempts you take to clear this exam. If you are a CA aspirant, are about to make an entry into this course and willing to clear all its level in the first attempt this article is for you. Read this article till the end to know what it takes to become a CA in First Attempt and all the perks associated with it. Once you become a CA, you will get ample opportunities knocking at your doorsteps. But you will have to toil really hard to make a way for all those opportunities come and knock your door. This a rewarding but a highly demanding career. You will be required to devote at least four years of your life to the preparation of this course. You will have to work extremely hard to cover the vast syllabus of each of its level. Judge your potential then only go for it. Chartered Accountancy involves primary three levels. With each stage, the level of this course increases, and it becomes difficult with every subsequent stage. But if you are determined and ready to devote yourself you will be able to clear each of its stage in the first attempt. Though there are no restrictions on the number of attempts you clear this exam. But with every attempt you fail, you lose your chance of becoming a successful CA and diminish the scope of opportunities you were about to get if you had cleared this exam in the first attempt. Companies while recruiting CA’s prefer candidates who have cleared all the levels in a single attempt or those who are rankers. The packages offered also depend upon the number of attempts taken by an individual to clear this exam. So, now you must have realized the importance of clearing this exam in the first attempt. How to Clear CA in First Attempt. Starting with CA foundation, which is an entry-level exam of this course. The syllabus of CA Foundation is similar to that of your class 11th and 12th, if you have decided to become a CA while opting for commerce stream it is better to start its preparation in the 11th class itself. As you are starting early and there is no rush, so devote at least an hour of your day for preparation of this exam, make your base strong, analyse past year papers which will give you the idea of the kind of questions that will be asked in the exam and that will make you exam ready. Once you are done with your 12th boards you will get an approximate period of 2 months before appearing in CA Foundation exam, as you started the preparation early, these two months will we more than enough for you to revise the entire course, and hence you can be sure of passing it in the first attempt itself. Once you have appeared for CA Foundation, without wasting any time you must start your preparation of CA intermediate for which you get approximately 9 months of the study period. This Exam consists of 2 groups, each group consists of 4 papers, you can appear for either 1 group at a time or for both the groups simultaneously. This completely depends upon your level of preparation. If you are not sure of appearing in both the groups simultaneously, appear for one than for other. Once you qualify either one or both the groups you can register for Practical training under a practicing CA. The practical training is for a period of 3 years. These three years are going to be hectic for you because you will be required to attend regular office and with that, you will have to manage your studies and CA Coaching Institute also (just in case you want to join for CA Final preparation).During your articleship days, any how to try to allot 2 hours for self-study and do not procrastinate & do it religiously.Try to cover your entire course for both the groups of CA Final in your articleship period itself as after approximately 2.5 yrs of your articleship you will be eligible to appear in CA FInal.For which students usually get around 4 months of preparation leave from their office.If you have completed the entire course in your articleship time period these four months of leave will be enough for you to revise your entire course at least 3 times. In the end, I would like to conclude that clearing CA Exam in the first attempt is no big deal, the only thing is you should be determined and ready for all the hard work it takes to clear this exam, and I am sure you will clear it in first attempt itself. in any other case, fifty thousand rupees. However, no deduction is allowed under section 80TTB to any partner of the firm or any member of the association or any individual of the body if said interest is derived from any deposit held by, or on behalf of, a firm, an association of persons or a body of individuals. For this purpose, "senior citizen" means an individual resident in India who is of the age of sixty years or more at any time during the relevant previous year. However, taxpayers claiming deduction under section 80TTB shall not be eligible for deduction under section 80TTA". In view of above, Circular NO.1/2019 may accordingly be treated as modified to this extent. The earlier corrigendum dated.01 .02.2019 stands withdrawn and cancelled. There was restriction for applying refund on quarterly basis for quarterly GSTR 1 filers. This restriction has been removed now. Application for appeal has to be submitted by the Appellant (Tax payer or Tax Department) to the First Appellate Authority. The Appellant also needs to submit certified copies within 7 days from the date of application or within the time limit allowed. The Appellate Authority may either admit the appeal by issuing the final acknowledgement or reject the application. When a taxpayer will make payment of GST using a bank, it will be updated in the Preferred Banks list for that taxpayer. Up to 6 Preferred Banks will be shown to a taxpayer while making e-Payment on GST Portal. When a Taxpayer already having 6 banks in its preferred bank’s list, makes a payment with 7th bank, then that 7th bank will be added in the preferred banks and the least used bank will be removed from the list. The taxpayer can delete any of the preferred banks at any point in time. 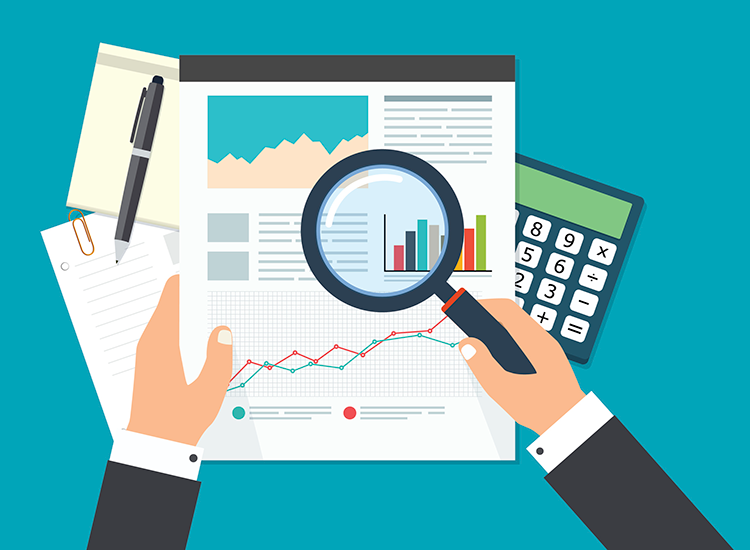 At the time of filing of Form GSTR-7, generally it is being checked automatically whether total amount deducted is 2% of the taxable value or not. Change – Now this auto checking has been removed. TDS Deductor will be free to report any value under CGST, SGST or IGST columns.. Same is implemented in offline utility also. At the time of generating E-way bill for outward supply, taxpayers enter the details of outward supplies such as invoice number, date, quantity, value, Tax, HSN code and Consignee GSTIN etc. Shreya Sen, a taxpayer is the assessee in the present case who submitted I.T Reurn for the assessment year 2018-19 without linking Aadhaar & PAN No. The revenue department appealed to the high court regarding the aforesaid problem. The High Court had permitted the respondents, Shreya Sen to file the Income Tax Return for the Assessment Year 2018-19 without linkage of their Aadhar and PAN numbers and it was also directed that the Income Tax Department would not insist on production of their number of Aadhar enrollment. The revenue department again appealed to the Supreme Court against the order passed by High Court. The High Court passed the order the when the aforesaid matter was pending consideration in the Supreme Court. Thereafter the Supreme Court passed the order to linkage PAN with Aadhaar mandatory. The respondents had already submitted I.T Return without linking Aadhaar as per direction of High Court and the assessment has also been completed. So it need not be implemented for the assessment year 2018-19. As per section 139AA inserted in the financial act 2017 to the Income Tax Act mandating quoting of Aadhaar or enrollment of ID of Aadhaar application form for filling of I.T Return. 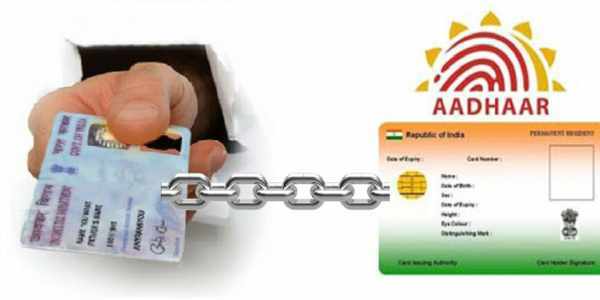 (ii)"Enrolment ID" means a 28 digit Enrolment Identification Number issued to a resident at the time of enrolment.'. In terms of Section 35(5) " Every registered person whose turnover during a financial year exceeds the prescribed limit shall get his accounts audited by a chartered accountant or a cost accountant and shall submit a copy of the audited annual accounts, the reconciliation statement under sub section (2) of section 44 and such other documents in such form and manner as may be prescribed". In terms of Rule 80(3) of the CGST Rules “every registered person whose aggregate turnover during a financial year exceeds two crore rupees shall get his accounts audited as specified under sub-section (5) of section 35 and he shall furnish a copy of the audited annual accounts and a reconciliation statement, duly certified, in GSTR 9C, electronically through the common portal either directly or through a Facilitation Centre notified by the Commissioner”. As per section 65 read with Rule 101 of CGST Rules, 2017 , commissioner or any officer authorised by him may conduct audit of any registered person for a financial year or multiples thereof. The registered person shall be informed by way of a notice not less than 15 working days prior to the conduct of audit in such manner as may be prescribed. The audit shall be completed within a period of 3 months from the date of commencement of the audit. However in case where commissioner is satisfied that audit can not be completed within 3 months then he may for the reasons to be recorded in writing, extend the period by a further period not exceeding 6 months. the date on which the records and other documents, called by the tax authorities are made available by the registered person, or the actual institution of audit at the place of business, whichever is later. As per section 66, any officer not below the rank of Assistant Commissioner with the prior approval of the Commissioner direct such registered person by a communication in writing to get his records including books of accounts examined. (ii) availed credit which is not within the normal limits. Audit to be conducted by a conducted by a Chartered Accountant or a Cost Accountant as may be nominated by the Commissioner. The Chartered Accountant or a Cost Accountant so nominated shall within the period of 90 days submit a report of such audit signed and certified by him to the said Assistant Commissioner mentioning therein such other particulars as may be specified. However the Assistant Commissioner may on an application made to him in this behalf by the registered person or the Chartered Accountant or a Cost Accountant for any material and sufficient reason, extend the said period by a further period of 90 days. The provisions of this section shall have effect notwithstanding that the accounts of the registered person have been audited under any other provisions of this act or any other law for the time being in force. Due date for deposit of tax deducted /collected at source for the month of January 2019. All sum deducted/collected by an office of the government shall be paid to the credit of the Central Government on the same day where tax is paid without production of an Income-tax Challan. Due date for filing GSTR-7 (to be filed by the persons who is required to deduct TDS under GST for the for the month of January 2019. Due date for filing GSTR-8 (to be filed by the by the e-commerce operators required to deduct TDS under GST for the for the month of January 2019. Due date for filing GSTR-1 for the month of January 2019. Applicable for those taxpayers whose annual aggregate turnover above Rs. 1.50/- Crore or who opted to file monthly Return only. Notification No. 44/2018 – Central Tax. Due date for filing GSTR-6 (to be filed by the Input Service Distributor for for the month of January 2019. Due date for issue of TDS Certificate for tax deducted under section 194-IA (TDS on Immovable property) in the month of December 2018. Due date for issue of TDS Certificate for tax deducted under section 194-IB (TDS on Certain Rent payment) in the month of December 2018. Due date for furnishing of Form 24G by an office of the Government where TDS for the month of January 2019 has been paid without the production of a challan. PF Payment for the month of January 2019. ESIC Payment for the month of January 2019. Due date for filing GSTR-5 & 5A (to be filed by the Non-Resident taxable person & OIDAR for the month of January 2019. GSTR-3B for the month of January 2019. Pay due Tax till this date. All Specified Companies (i.e. Companies who get supplies of goods or services from micro and small enterprises and whose payments to micro and small enterprise suppliers exceed 45 days from the date of acceptance or the date of deemed acceptance of the goods or services as per section 9 of the Micro, Small and Medium Enterprises Development Act, 2006) to file details of all outstanding dues to Micro or small enterprises suppliers existing on 22nd January, 2019 within thirty days. Every registered person having turnover of more than Rs. 2 Crore has to file the reconciliation statement along with certificate by an Auditor as prescribed in Form GSTR 9C. For proper execution of work a detailed checklist should be devised which clearly states the various details to be checked, manner of checking and the extent of checking. This ensures that important issues are not overlooked.